For other uses, see Blue Riband (disambiguation). For use of the related term "Blue Ribbon", see Blue ribbon (disambiguation). The Sirius is considered the first Blue Riband holder for her 1838 voyage to New York at 8.03 knots (14.87 km/h). The Blue Riband (pronounced /ˌbluː ˈrɪbənd/) is an unofficial accolade given to the passenger liner crossing the Atlantic Ocean in regular service with the record highest speed. The term was borrowed from horse racing and was not widely used until after 1910. Under the unwritten rules, the record is based on average speed rather than passage time because ships follow different routes. Traditionally, a ship is considered a “record breaker” if it wins the eastbound speed record, but is not credited with Blue Riband unless it wins the more difficult westbound record against the Gulf Stream. Of the 35 Atlantic liners to hold the Blue Riband, 25 were British, followed by five German, three American, as well as one each from Italy and France. 14 were Cunarders, 5 by White Star, with 4 owned by Norddeutscher Lloyd, 2 by Collins, 2 by Inman and 2 by Guion, and one each by British American, Great Western, Hamburg-America, the Italian Line, Compagnie Générale Transatlantique and finally the United States Lines. Many of these ships were built with substantial government subsidies and were designed with military considerations. Winston Churchill estimated that the two Cunard Queens helped shorten the Second World War by a year. The speed of the last Atlantic liner to hold the Blue Riband, the United States was designed for her potential use as a troopship rather than her service as a commercial passenger liner. There was no formal award until 1935 when Harold K. Hales (1868–1942), a British politician and owner of Hales Brothers shipping company, donated a trophy. However, the rules for the Hales Trophy are different from the traditional rules for the Blue Riband. For example, the Hales Trophy can be won by any type of surface commercial passenger vessel for a crossing in either direction. After the United States retired, the trophy was displayed in the American Merchant Marine Museum. In 1986, Richard Branson established a new speed record in a powerboat that cut two hours from the eastbound record, but was not awarded the Hales trophy because his boat was not a commercial passenger vessel. Four years later, in 1990, the owners of the passenger/car ferry Hoverspeed Great Britain received the Hales trophy when she established a new speed record for a commercial vessel on her eastbound delivery voyage without passengers with a time of 79 hours and 54 minutes. In 1992 the Italian ship Destriero, with an average speed of 63 mph (101 kmh), improved the previous record to 58 hours and 34 minutes. However, the United States remains as the holder of the Blue Riband because all subsequent record breakers were not in Atlantic passenger service and their voyages were eastbound. In 1843, Great Western recorded a Blue Riband voyage of 10.03 knots (18.58 km/h). In 1832, Junius Smith, American lawyer turned London merchant, published the idea building a line of transatlantic steamships in the American Rail Road Journal. After receiving no support for several years, his plan gained credibility when Scottish shipbuilder, Macgregor Laird became an investor. Smith, who is often considered the Father of the Atlantic Liner, formed the British and American Steam Navigation Company to operate a London-New York service. About the same time, the question of Atlantic steamships was discussed at a 1835 director's meeting of the newly formed Great Western Railway when the line’s chief engineer, Isambard Kingdom Brunel supposedly joked that the line could be made longer by building a steamship to run between Bristol and New York. The necessary investors were recruited by Brunel's friend, Thomas Guppy, a Bristol engineer and businessman. The next year, the Great Western Steamship Company was established, even though the rail line was still years from completion. By spring 1838, Brunel’s Great Western was ready for sea, but Smith’s first ship was still without engines. When Great Western scheduled its initial sailing, Laird suggested that British and American charter the Irish Sea steamer Sirius from the St. George Steam Packet Company for two voyages to beat Great Western. While the Sirius left Cork, Ireland four days before Great Western departed Avonmouth, Great Western still came within a day of overtaking Sirius to New York. To complete the voyage, Sirius was forced to burn spars when coal ran low. With her westbound crossing at 8.03 knots (14.87 km/h), Sirius is considered the first holder of the Blue Riband even though the term would not be used for several generations. Great Western herself became the prototype for all successful wooden paddlers and made a Blue Riband voyage at 10.03 knots (18.58 km/h) as late as 1843. Europa of 1848 won the Blue Riband with a voyage of 11.79 knots (21.84 km/h). This is one of the earliest known photos of an Atlantic steamship. The Cunard Line started its Liverpool-Halifax-Boston service in 1840 with the four ships that were slightly reduced versions of Great Western with about the same speed. Ultimately Cunard built nine additional wood paddlers. By 1846, Cunard was the only original steamship line that survived, largely because of its subsidy from the British Admiralty to carry the mails and its emphasis on safety. Until 1850, the record passed between various Cunarders, finally reaching 12.25 knots (22.69 km/h) for a 8 day Liverpool-Halifax crossing by Asia. Record voyages during this period were often the result of using sails to gain extra speed from a following gale. Cunard's first serious competition for the Blue Riband came from the American owned Collins Line. The American Government supplied Collins with a substantial subsidy to operate four wooden paddlers that were superior to Cunard's best. In its first year, 1850, the Pacific won the Blue Riband at 12.46 knots (23.08 km/h) on a 10 day run from Liverpool to New York. Unfortunately, Collins suffered a setback when its Arctic foundered with heavy loss of life. The next year, Cunard put further pressure on Collins by commissioning its first iron-hulled paddler, the Persia, which won the Blue Riband with a 9 day, 16 hour Liverpool-New York voyage at 13.11 knots (24.28 km/h). During the Crimean War, Cunard supplied eleven of its ships for war service and suspended all routes except the Liverpool-Halifax-Boston service. While the Collin's fortunes improved because of the lack of competition during the war, Collins collapsed in 1858 after the loss of two additional steamers. Cunard emerged as the leading carrier of first class passengers and in 1862 commissioned the Scotia, the last paddle steamer to win the Blue Riband with a Queenstown-New York voyage at 14.46 knots (26.78 km/h). Scotia was the final significant paddler ordered for the Atlantic because under the terms of Cunard's mail contract with the Admiralty, it was still required to supply paddle steamers when needed for military service. In 1845, Brunel’s Great Britain became the first iron-hulled screw liner on the Atlantic. Starting in 1850, the Inman Line built numerous reduced versions for the steerage trade. In 1866, Inman started to commission single screw express liners that were the equal of Scotia. The Admiralty allowed Cunard to order its first screw express liner, the Russia. In 1871 both companies faced a new rival when the White Star Line commissioned Oceanic and her five sisters. The following year, White Star’s Adriatic finally surpassed Scotia with a voyage at 14.65 knots (27.13 km/h). The new White Star record breakers were especially economical because of their use of compound engines, but their high ratio of length to beam (10:1 compared to the previous norm of 8:1) increased vibration. To counter this, White Star placed the dining saloon midships and made their ships more luxurious. Inman rebuilt its express fleet to the new standard, but Cunard lagged behind both of its rivals. In 1875, Inman’s new City of Berlin averaged 15.21 knots (28.17 km/h) on its Blue Riband voyage. 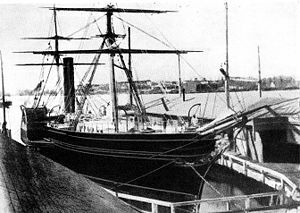 During the five-year shipping depression that began in 1873, William Pearce, the controlling partner of the John Elder shipyard, became convinced that a crack steamer that carried only passengers and light freight could be profitable because she would attract more passengers and spend less time in port. He proposed a ship that crammed the most powerful machinery possible into the hull, sacrificing everything to speed. When Cunard rejected his proposal, Pearce offered his idea to the Guion Line, a firm primarily engaged in the steerage trade. The first ship Pearce built for Guion, the Arizona was described as a "souped up transatlantic hot rod" by one nautical historian. While she only won the eastbound record, two years later, Guion took delivery of the even faster Alaska that won the Blue Riband at 16.07 knots (29.76 km/h). To continue the program, Pearce offered Guion favourable terms on a third unit, the Oregon, which raised the Blue Riband to 18.56 knots (34.37 km/h) in 1884. These ships were uncomfortable and their excessive coal consumption made them uneconomic. However, for a while they were popular with American clients because of their American ownership. After being out of the contest for a decade, Cunard finally started to rebuild. In 1884, Cunard purchased the Oregon from the Guion line when that firm defaulted on payments to the shipyard. Later that year, Cunard commissioned the first steel-hulled Blue Riband winners, the Umbria and Etruria. Etruria, the faster of the pair, raised the Blue Riband standard to 19.56 knots (36.23 km/h) on a 6 day, 2 hour run from Queenstown to Sandy Hook in 1888. However, Etruria and her sister represented the limit of single screw technology. Inman's City of Paris broke 20.01 knots (37.06 km/h) in 1889. The Inman line fell on hard times after their intended Blue Riband contender, the City of Rome failed to meet expectations and was returned to her builders in 1882. Inman directors agreed to voluntary liquidation so that the largest creditor, the Philadelphia-based International Navigation Company could purchase Inman's assets. The new owners provided the capital to build two outstanding record breakers, the twin screw City of New York and the City of Paris. Starting in 1889, the later ship won the Blue Riband on four occasions, including a voyage at 20.7 knots (38.3 km/h) in 1892. White Star, which had not built an express liner since the Germanic of 1875, commissioned the Blue Riband winners,Teutonic of 1889 and Majestic of 1890 after receiving a subsidy from the Admiralty to make the pair available as merchant cruisers in the event of hostilities. Cunard countered with two even faster Blue Riband winners, the Campania and the Lucania of 1893. The next year, Lucania recorded a voyage at 21.81 knots (40.39 km/h). Inman became the American Line and ordered two additional express liners from American yards, but no attempt was made to best the new Cunarders. In 1894, Guion ceased sailing as its ships were now hopelessly outdated. No sooner had Cunard reestablished its supremacy than new rivals emerged. Beginning in the late 1860s, several German firms commissioned liners that were almost as fast as the British mail steamers working from Liverpool. In 1889, the Hamburg-America Line commissioned four double screw steamers capable of 18.00 knots (33.34 km/h). Its rival, Norddeutscher Lloyd (NDL) lagged behind until 1895 when it ordered two ships intended to take the Blue Riband. In 1898, the Kaiser Wilhelm der Große raised the Blue Riband to 22.29 knots (41.28 km/h), while the other liner, the Kaiser Friedrich failed to achieve her contract speed and was returned to her builders. Hamburg America ordered the even more powerful Deutschland that reached 23.06 knots (42.71 km/h) on one of her 1900 Blue Riband voyages. However, Hamburg America quickly learned that these high powered double screw liners had vibration problems. Deutschland had the unpleasant nickname, "cocktail shaker" and actually lost part of her stern in 1902 because of the constant vibration. Rather than match the new German speedsters, White Star decided to drop out of the competition and commission the four large Celtic-class luxury liners of more moderate speed. White Star realised that passengers preferred comfort even if this means spending an extra day at sea. In 1902, White Star joined the well capitalised American combine, the International Mercantile Marine Co. (IMM) that owned the American Line and others. IMM also had trade agreements with Hamburg America and Norddeutscher Lloyd. After its bad experience with the Deutschland, Hamburg America also dropped out of the race and commissioned large luxury liners based on the Celtic. However, NDL completed building a fleet of four additional express liners modelled on Kaiser Wilhelm der Große. CGT's Normandie won the Blue Riband at 30.58 knots (56.63 km/h) in 1937. Cunard's Queen Mary regained the Blue Riband at 30.99 knots (57.39 km/h) in 1938. As a result of the war, Hamburg American and Norddeutscher Lloyd lost their premier units. In 1926, the U.S. Government awarded Norddeutscher Lloyd (NDL) $27 million in compensation for its confiscated liners. By this time, improvements in turbine technology and hull form along with the use of fuel oil instead of coal made it possible to build more civilised record breakers. Using these funds, NDL ordered two ships designed to cross the Atlantic in five days, the Bremen and Europa. However, the American government netted the award against debts owed by the German Government and Berlin was forced to directly subside NDL to continue the project. Bremen recorded 27.83 knots (51.54 km/h) on her 1929 Blue Riband voyage and Europa increased the Blue Riband to 27.92 knots (51.71 km/h) in 1933. In 1929, two lines from Italy each ordered a ship based on the German pair. Just as these ships were being completed, the Italian government nationalised the shipping industry, creating the Italian Line. While both superliners were successful, only the Rex won the Blue Riband, with a 1933 voyage at 28.92 knots (53.56 km/h). Compagnie Générale Transatlantique also ordered a new superliner in 1929. The next year, Cunard started construction on a 80,000 ton liner that was to be the first of two record breakers fast enough to fit into a two ship weekly Southampton-New York service. Compagnie Générale Transatlantique altered its plans to make its new liner even bigger. However, as the 1929 shipping depression intensified, construction on Cunard’s hull 534 was halted while work on the heavily subsidised French ship continued. By 1934, White Star was failing and the British Government was concerned about potential job losses. Therefore, the government offered Cunard a loan of £3 million to complete hull 534 as the Queen Mary and an additional £5 million to build a second ship, the Queen Elizabeth if Cunard merged with White Star. Compagnie Générale Transatlantique’s Normandie entered service in 1935 and won the Blue Riband at 29.98 knots (55.52 km/h). Queen Mary was commissioned the next year, and after a few break-in voyages, took the Blue Riband to 30.14 knots (55.82 km/h). The two liners were operated a pair and traded the Blue Riband again, with the Cunarder ultimately posting 30.99 knots (57.39 km/h) in 1938. Queen Mary’s consort, the Queen Elizabeth, was commissioned after war was declared and was never allowed to attempt the record. Of the ships of state, only Queen Mary, Queen Elizabeth and Europa survived the war. Europa became Compagnie Générale Transatlantique's Liberte and no attempt was made to retain her former speed when she was reconstructed. However, the United States government was impressed by the large numbers of troops carried by the Queens during the war, and ordered a superliner that was as much a troop carrier as an express liner. On her maiden voyage in 1952, the United States upped the Blue Riband to 34.51 knots (63.91 km/h). In 1958, the transatlantic airlines put jet transports into service and the days of the record breakers were numbered. Liberte retired 1961, Queen Mary in 1967, and the United States in 1969. In 1935, Harold K. Hales (1868–1942), a member of the UK Parliament and owner of a shipping company, commissioned a Sheffield goldsmith to produce a large trophy to be presented to the fastest ship crossing the Atlantic. The rules for the trophy did not correspond to the traditional rules for the Blue Riband in that the trophy could be awarded to any surface passenger ship achieving the fastest speed in either direction. Other rule changes further complicated the situation. For example, before the trophy was finished, Hales made arrangements to present the trophy to the Rex. In the meantime, Normandie took the record and Hales changed the rules so that any new claimant must wait three months to give the current holder a chance to beat the new record. In August, 1935, the trophy was presented to the Rex, and then transferred to the Normandie two months later. Cunard's Queen Mary was the next winner, but Cunard refused to accept the trophy. The Queen's captain explained that, "We don't believe in racing on the Atlantic, or in blue ribands, or trophies and the like." Hales again changed the rules so that the trophy could only be won by a "non-British ship". Hales died in 1942 and the location of the trophy was unknown when the United States Lines (USL) started planning the maiden voyage of its new record breaker, the United States. The trophy was found at the Sheffield goldsmith where it had been originally made. In 1952, USL accepted the trophy at a ceremony attended by 400 guests. It was displayed in USL's New York City headquarters until after the United States was taken out of service in 1969. Ten years later, the trophy was transferred to the U.S. Merchant Marine Academy's museum as a relic. In 1986, Richard Branson was successful in setting a new eastbound transatlantic speed record in the powerboat Challenger II. He was not awarded the Hales trophy because his boat was not a commercial vessel. In 1990, the 242-foot catamaran passenger/car ferry Hoverspeed Great Britain was scheduled to take a delivery voyage from her Australian builders to begin cross channel operations. Her owners confirmed with the Hales trophy trustees in the UK that their vessel would be eligible for the trophy if they beat the United States record, even though the ship would not actually carry passengers on the trip. The trustees ruled that the ship still met the criteria. After Hoverspeed Great Britain's successful voyage, the Maritime Museum considered challenging the decision on the grounds that Hales donated the award for ships providing Atlantic passenger service, but decided not to because of the cost of legal fees. The trophy case at the academy remained empty for the next eight years until Carnival Cruise Lines loaned the museum a replica of the trophy. In 1992, the Italian powerboat Destriero made a voyage at 53.09 knots (98.32 km/h), breaking Challenger II's record. The current holder of the Hales Trophy is the catamaran Cat-Link V (now Fjord Cat) for a 1998 delivery voyage (without passengers) at 41.3 knots (76.5 km/h). However, the United States is still considered the holder of the Blue Riband. The following is the latest consensus list of the research to date. Because there was no sanctioning body for the Blue Riband, researchers are limited to surviving shipping company archives and press reports to develop the list of Blue Riband winners. Early writers including Arthur Maginnus (1892), Henry Frey (1896), Charles Lee (1931) and C. R. Benstead (1936) were the standard sources until the 1950s. Since then, C. R. Vernon Gibbs (1952), and Noel Bonsor (1975) added to the body of knowledge, with additional detail about the German ships provided by Arnold Kludas. Over the years, the lists have not agreed. For example, Gibbs credits Inman's City of Paris with a 1866 Blue Riband voyage, and Cunard's Russia with an eastbound record the following year because he considered as dubious Scotia's Blue Riband claim of 14.46 knots (26.78 km/h), supposedly based on a very long track. Later writers have included the Scotia claim. Gibbs also includes the claimed Blue Riband voyage at 17.6 knots (32.6 km/h) of the National Line's America of 1884 that was not confirmed by later researchers. ↑ 1.00 1.01 1.02 1.03 1.04 1.05 1.06 1.07 1.08 1.09 1.10 1.11 1.12 1.13 1.14 1.15 1.16 1.17 1.18 1.19 1.20 1.21 1.22 1.23 1.24 Kludas, Arnold (1999). Record breakers of the North Atlantic, Blue Riband Liners 1838-1953. London: Chatham. ↑ 2.0 2.1 2.2 2.3 Fox, Stephen. Transatlantic: Samuel Cunard, Isambard Brunel and the Great Atlantic Steamships. ↑ 3.00 3.01 3.02 3.03 3.04 3.05 3.06 3.07 3.08 3.09 3.10 3.11 3.12 3.13 3.14 3.15 3.16 3.17 3.18 3.19 3.20 3.21 3.22 3.23 3.24 Gibbs, Charles Robert Vernon (1957). Passenger Liners of the Western Ocean: A Record of Atlantic Steam and Motor Passenger Vessels from 1838 to the Present Day. John De Graff. ↑ 4.0 4.1 4.2 4.3 4.4 Maxtone-Graham, John (1972). The Only Way To Cross. Collier. ↑ 5.0 5.1 N Y Times (15 July 1990). Suit may be filed over Hales trophy. ↑ Pond, Edgar LeRoy (1927). Janius Smith. ↑ 7.0 7.1 7.2 American Heritage (1991). The Annihilation of Time and Space. ↑ Corlett, Ewan (1975). The Iron Ship: the Story of Brunel's ss Great Britain. Conway. ↑ 9.0 9.1 9.2 9.3 9.4 9.5 9.6 Fry, Henry (1896). The History of North Atlantic Steam Navigation with Some Account of Early Ships and Shipowners. London: Sampson, Low & Marston. OCLC 271397492. ↑ N Y Times (10 November 1942). British writer-merchant missing. ↑ Time Magazine (29 July 1935). Card's Cup. ↑ N Y Times (21 August 1935). Rex gets blue riband. ↑ N Y Times (24 October 1935). Ocean speed trophy goes to Normandie. ↑ N Y Times (26 August 1936). Queen Mary Scorns Actual Pennant. ↑ 15.0 15.1 15.2 15.3 N Y Daily News (20 November 1998). Award makes splash at Maritime Museum. ↑ N Y Times (13 November 1952). Ship speed trophy is presented here. Arnd Stroeh (27 Feb. 2003). "From Superliners to Airliners". http://web.bryant.edu/~ehu/h364proj/fall_98/stroeh/index.htm. Retrieved 2 Jan. 2008. Jeff Newman. "The Blue Riband of the North Atlantic, westbound and eastbound holders". greatships.net. http://www.greatships.net/riband.html. Retrieved 2 Jan. 2008.
which cites N.R.P. Bonsor (1980). North Atlantic Seaway, Vol. 5. Michael Pocock. "Information about the Kronprinz Wilhelm's award-winning voyage". Maritime Quest. 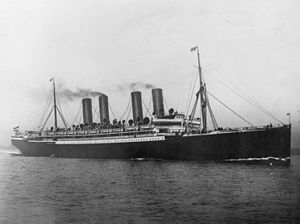 http://www.maritimequest.com/liners/kronprinz_wilhelm_1901/kronprinz_wilhelm_data.htm. Retrieved 2 Jan. 2008. This page was last edited on 8 July 2010, at 15:34.